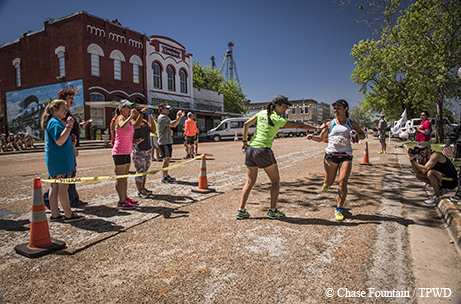 The Texas Independence Relay takes runners on a historical route from Gonzales to San Jacinto. Texians must have seen the future as a dark and friendless place in the early part of 1836. Miserable with hunger, cold and disease, the settlers and their families retreated eastward ahead of the Mexican army in a desperate scramble called the Runaway Scrape, abandoning or burning their homes and towns behind them. How strange the scene along parts of their route more than 180 years later would have seemed: The people of this future age, still running, though now in joy rather than fear, the settlers’ weary horses and wagons replaced by a caravan of runners and rental vans. 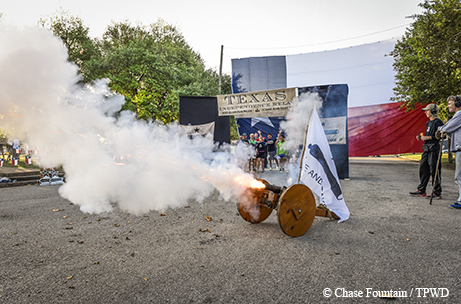 The annual Texas Independence Relay begins each March in Gonzales — where the first shot of the Texas Revolution was fired from a cannon with a defiant “Come and take it!” — and ends where the war for independence was won on the San Jacinto battleground, a journey of roughly 200 miles. In a staggered start, each team of up to 12 runners is announced by its chosen theme song and a cannon blast, with the slowest predicted team setting out before sunrise and the fastest in the afternoon. 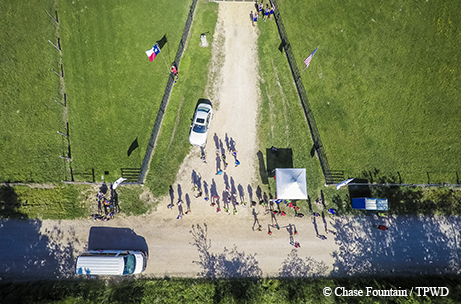 Team members run together for a short prologue and epilogue, but otherwise each of the race’s 40 legs, which vary in length and elevation, is assigned in advance to one runner; teammates exchange a wristband at established checkpoints where team vans wait for drop-off and pickup. A thousand moving parts make the TIR a test of both physical endurance and meticulous planning. Unlike a traditional mass-start race that begins as a mob and then stretches out behind the front-runners, in the TIR the faster teams that started later in the day will steadily catch the teams ahead, and most will cross the finish line within a few hours of each other. “I tell people it’s like a celebration of running,” says Josh Thompson, high school orchestra director and team captain of 2017’s fastest team, the Dolls and Towel Boyz. All DnTB members are dedicated athletes — two women on the team ran in the Olympic trials for the marathon — but their roster represents just one side of a diverse spectrum of TIR runners with equally diverse goals. Some are running for a charitable cause. Others hope to reach a fitness goal, spend the weekend with friends or try a new challenge. Among them you’ll find every walk of life in the running world — 10-minute milers and 6-minute milers, veterans groups and disabled athletes, co-workers and church groups, running clubs and cultural societies, all genders and ages and ethnicities and professions. Husband-and-wife race directors and TIR founders Jay and Joy Hilscher hosted the first relay in 2008. Most of their six children, ages 5 to 20, have grown up with their parents’ passion for the race. The Hilschers, who met as cross-country runners in college, had wanted to create a uniquely Texan answer to Oregon’s Hood to Coast Relay. The long-distance relay format also captured what they’d come to realize through their years of competitive running — that while individual goals were important, they weren’t what they enjoyed the most. “The relationships formed through the backdrop of sport end up being more meaningful than the accomplishments themselves,” Jay says. On March 25, 2017, at Exchange Point 2 teams mingle and wait along a dirt road only a stone’s throw from the ancient oak where Sam Houston briefly established a camp the same month in 1836. If there are revolutionary ghosts beneath Houston’s tree, perhaps their unblinking gaze turns from the western sky — where in their day they would have seen the glow of the town of Gonzales burning — to the expectant gauntlet that has formed on the road. Amid shouts of encouragement from the crowd, a runner passes through the exchange, and fresh legs take her place. Volunteer staff mark the time, the crowd reshuffles for the next arrival, and the runner who has finished catches her breath before joining her teammates in a van, which will pass the scattered procession of runners up the road and then wait again at the next exchange point, where the cycle repeats. Most of the 191 teams will take between 27 and 32 hours to finish the race. Patricia Smith, an associate professor of English at Lone Star College–Cy Fair and team captain of Drag’n (whose members hail from seven different countries), admits the TIR wasn’t something she would have imagined herself doing in the recent past. The first half of the TIR is the country miles — dirt and gravel roads, green pastures, old barns, more cows than cars. The race moves along the route in a slow but steady trickle, and the sun climbs hot and glaring, inescapable for the runners on the open road. Whatever sufferings there may be, however, these are people at play. Jokes and jabs are traded freely among strangers, vans are elaborately decorated, and grown adults wear costumes ranging from matching pink tutus to the eponymous coiffure of The Mullets. Former co-workers, The Mullets have fielded a team since 2009 and are well-known for their penchant to let loose on race weekend; this year one of their vans has a clothesline of undergarments duct-taped to the windows. “We like to make sure no one takes this too seriously,” team captain Cory Lucas says. “Smile, you paid to do this.” Some years the dates of the TIR coincide with the Sausage Fest in Schulenburg, an incongruous mix. The town of Weimar presents commemorative batons to runners who complete Leg 11. The mementos make it a coveted segment, and Weimar native Tara Dilley, who’s helped to organize the effort every year since the inaugural TIR in 2008, says she sees many familiar faces. One face stands out, however; Dilley likes to give Charlie Jones his baton in person. Michelle Jones — Charlie’s mother and director of the Corpus Christi chapter of myTEAM TRIUMPH, a nonprofit that helps individuals with disabilities to participate in endurance events — explains that for 18-year-old Charlie, who has cerebral palsy, the atmosphere and excitement of the race are electrifying. This year, 12 runners take turns piloting Charlie and 16-year-old Holly Slough, who has Down syndrome, in special chairs for 73 miles of the race. Jones’ voice breaks with emotion as she talks about how other vans will pull over, how the runners will line the streets and cheer at the top of their lungs. The feeling is indescribable, Jones says. You’re running, doing something you love, but at the same time you’re sharing the experience with a person for whom the warmth of the sun and the feel of the wind on his face offer the purest form of joy. The sun begins to dip below the horizon for most teams around the time they reach Columbus. At Wallis High School, runners can spread a sleeping bag on the gym floor and shower in the locker rooms. Some teams prefer to pull over at a truck stop or hotel, and others make do with baby wipes and shifts sleeping in the van. The night legs are the quietest, the loneliest, and often runners can’t see beyond the small circle cast by their headlamps. For Tori Benard, assistant principal at Woodrow Wilson Junior High in Dayton and team captain of first-year team Pray Run Sparkle, leaving the exchange in Columbus where she was surrounded by people and music and light for the sudden darkness and barking dogs of the back roads was daunting. But she remembered talking with science teachers at her school about why it’s no longer possible to see the stars and how here it’s different: To the left, where the lights of town and interstate bled into the sky, it was blank and empty, but on the other side, there was a sparkling canopy. East of Fulshear, a spiderweb of pavement begins. 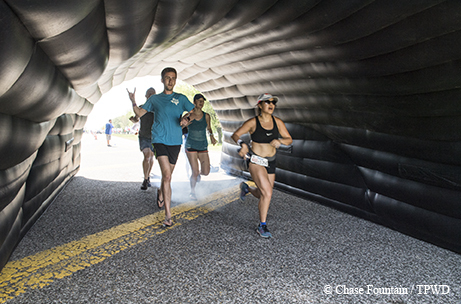 Runners traverse Cinco Ranch and then twist their way across the western side of Houston to the heart of downtown and the exchange point at Smith Fountain, where they start heading southwest through Midtown and the Museum District before zig-zagging through East Houston and Pasadena. As runners navigate this sea of urban sprawl from affluent suburbs in the west to refineries in the east, they also experience Houston’s best parks and natural areas, gems like George Bush Park, Terry Hershey Park, Memorial Park, Hermann Park and the Brays Bayou Greenway Trail. On Allen Parkway, the race route passes about a block north of Founders Memorial Cemetery, where many notable citizens of the Republic of Texas and veterans of the Texas Revolution are interred. 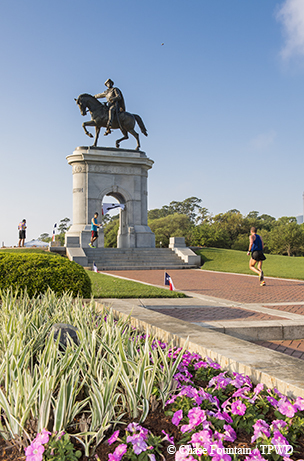 At the traffic circle near the entrance to Hermann Park, runners exchange their wristband directly beneath a statue of Sam Houston. Astride a horse, Houston points eastward, of course, to San Jacinto. Amy Craft, lawyer and longtime runner a few weeks away from competing in her fifth Boston Marathon, is a 20-year resident of Houston. The 2017 TIR is her first long-distance relay as well as an opportunity to see her city and state in an entirely new way — as the eyes for someone else. Connected by a section of flexible tubing, Craft leads blind runner and professional singer Jessica Callahan for Team Catapult. “The main thing is to call out things in the road, even things you wouldn’t think about, like a little dip, or a pothole, or a rock,” says Craft. Houston-based nonprofit Catapult assists physically challenged individuals to access and thrive in the endurance sports world. In addition to visually impaired runners in one van, there’s a second van of Catapult runners who are mobility impaired or have prosthetic limbs. The two groups jokingly refer to themselves as “Cyclops” and “Autobots” — all in good fun in a setting where they are no less respected, and certainly no less tough, than any other athletes in the race. On April 21, 1836, Houston’s forces routed the Mexican army at San Jacinto in a surprise attack. In the annals of time, the Runaway Scrape and the terror that had sent every man, woman and child rushing in panic toward the Sabine River would fall into shadow behind this victory and the doomed but heroic battles at the Alamo and Goliad. 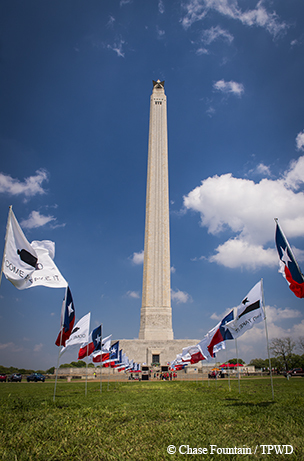 In a 0.6-mile epilogue, TIR teams run together to the base of the San Jacinto Monument, celebrating the culmination of their own journey. Perhaps some are even the distant descendants of those who fought here. National organization Team Red White & Blue, which creates community opportunities for military veterans through social or physical activities, has five teams in the race. Team Taco, promoting awareness of post-traumatic stress disorder, has dedicated its effort to a sergeant from one of its team member’s units who had taken his own life a month before. At the monument, they present an American flag and their race wristband to the sergeant’s widow. 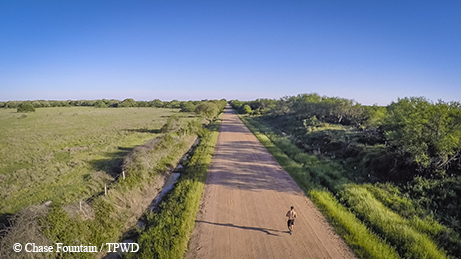 Whether spoken or unspoken, happy or sad, every runner has a reason for being here and doing this, and this is when that reason comes to the surface with a sense of emotion and exhaustion as big as the Texas sky. Julie Luebbert, team captain of Chafing the Dream, competed in her first TIR in 2016. She described the year leading up to the race as a dark period in her life — she’d lost her sister and father to cancer and was simultaneously planning burials, going through a divorce, searching for a job and trying to qualify for a home loan. Under such circumstances, committing to a two-day race across the state would seem unwise. But Luebbert says she found in it a reminder that she could be strong when she had to be. It was something to focus on, something bright. “During that darkest time, I was actually running the fastest I’d ever run,” she says. Something beautiful. Something bright. Something uniquely Texan.